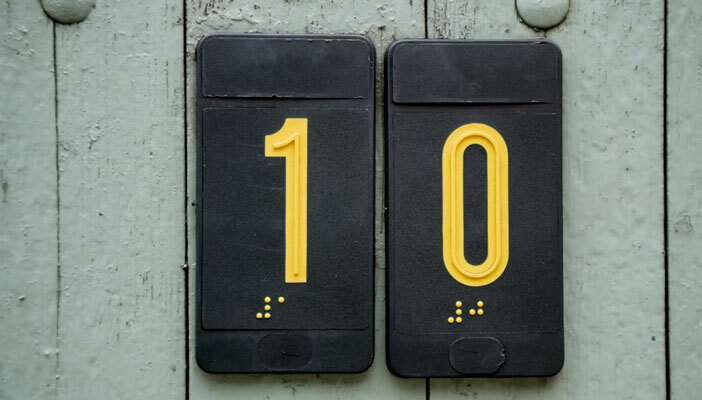 In part three of our series, John Chester, VI Learning Coordinator from Middlesbrough, explains Unified English Braille (UEB) signs in the world of Mathematics. Two years ago, I attended training aimed at preparing braille teachers and transcribers for the impending changes of Unified English Braille (UEB), and the consequent impact the changes would have on the use of technical materials. Much of the session was aimed at providing attendees with a working knowledge of the new UEB signs in the world of Mathematics. It dawned on me that almost everything we understood of the ‘Maths code’ and ‘Science code’, was changing. The only thing that seemed to remain the same was the signs we use for numbers and the number sign (for Numeric mode). If you are new to braille or just reading this out of interest, it’s worth starting with the basics. Just like in Standard English Braille (SEB), numbers in UEB are created in the same way. Remember there is no ‘Maths code’ or ‘Science code’; UEB is the code and under that umbrella are all the signs you need. Another important note, especially for transcribers, is that wherever possible the braille should follow the print format. This dictates some of the decisions you take when formatting a document. Following the rules regarding Numeric and Grade 1 mode means that the ways which we can write the date or time numerically differ. Familiarise yourself and your students with the different methods. The first example requires a second number sign as the colon turns the switch back off. The full-stop does not switch numeric mode off – only one number sign is needed here. When using a forward slash in the date, the length of the braille significantly increases. Think about what is most practical for your students. The way we write fractions has changed. Using a lower number to represent the denominator now no longer works due to the fact these can be mixed up with punctuation or other signs. The new method makes more sense and clears up ambiguity. In short yes, but don’t worry. The level of braille you create or teach depends on the technical abilities of your student. Information on UEB in general and technical materials is only a click away – the Internet can be your best friend. The braille in this article is only the tip of the iceberg. Remember to ask for help! You don’t need to be a braille genius. Maybe you can fit the whole contents of the guidelines into your head, but I know I can’t.